In Allplan 2013 and 2013-1, the use of wizards is simplified and accelerated. Both default and personalized wizards can be used to standardize 2D elements, 3D elements or associative views. 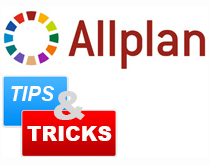 With Allplan 2013, new default wizards are delivered. Some of these include 2D elements such as lines, dimension lines, patterns and hatchings. In other default wizards, 3D elements can be found such as walls, columns, floors, doors and windows. To save a drawing file as a personalized wizard, the new tool "Save and show copy as a wizard" from the "File" menu can be used. First enter the name for the new wizard and then choose the appropriate wizard group. After you have saved it, the new wizard is opened automatically in the Wizards palette. When selecting and dragging 2D or 3D elements from the wizard to the drawing file, the entire object is placed in the drawing file. When performing a right mouse button double click on elements in the wizard, the relevant tool opens with the same settings as the object in the wizard. This makes it possible to work with standardized settings in fast manner. When using option "Match parameters from... " in any tool, the settings from the element in the wizard can be taken over. In Allplan 2013, associative views and sections can also be included in wizards. To save a drawing file with associative views as a wizard, the file should not have any references to other drawing files. Associative views in the wizard can be used in a second manner: by performing a right mouse button double click. The settings that are adopted include the hidden line settings and section settings. A drawing file with reinforcement can also be saved as a wizard. The reinforcement can be used through a right mouse button double click. Dragging reinforcement into a drawing file is not possible. When trying to do so, a message will appear. To save a 3D model with reinforcement and associative views, the symbol library can be used.